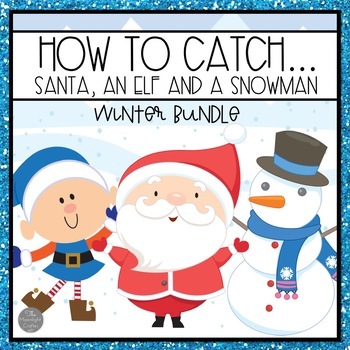 I have BUNDLED FOUR of my How to Catch.... book companions and flip book sets for savings! It's so fun to think of ways to catch Santa! Everyone remembers wanting to catch a glimpse of Santa, and this book companion will get your students scheming about how to catch Santa! 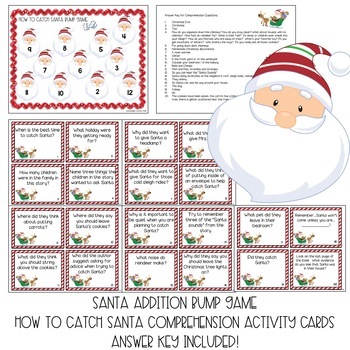 Use these materials along with the book How to Catch Santa by Jean Reagan! There are plenty of materials included in this book companion....you should have enough for a week of Santa Catching Fun! Illustrate one of the Christmas Riddles! What are some "Santa Sounds"? Write them inside of the Christmas Packages! Draw an idea you have for catching Santa...and then draw what you hope will happen! What is your plan? Organizer for writing it out! What is your plan? Draw it out! Think Like Santa! !.....I love this activity! The children in the story had questions for Santa! Like....How do you squeeze down the chimney? Do you really eat the cookies at every house? Who invents all of the cool toys? What makes the reindeer fly? 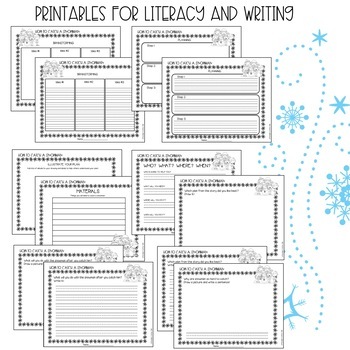 This creative writing activity gets your children to "think like Santa" and try to answer the questions! So much FUN! How do you think Santa would feel if he got caught? How do you think Mrs. Claus feels when Santa takes off in his sleigh? How do you think the reindeer feel after all of that flying? How do you think the elves feel when all of the presents and toys are ready to be delivered? These fun social emotional pages have blank faced templates for each of the North Pole Friends and your children will think about how they may feel in each situation and draw their emotions and write/name the emotion on the bottom of the page! 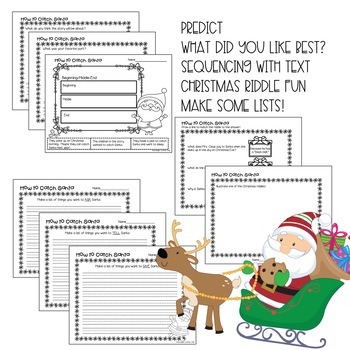 Use these fun flip book templates to engage your little writers and encourage them to respond to the story How to Catch Santa by Jean Reagan. "What questions do you have for Santa?" "What do you want to TELL Santa?" What do you want to GIVE Santa?" The author elaborates on each of these subjects and it is a perfect opportunity for your students to think of some of their own ideas for each of these questions! Enjoy both black and white low ink options and color options!